EURATEX, the European Textile and Apparel Confederation, is the Confederation that represents the interests of the European textile and clothing industry when dealing with the institutions of the EU. In order to do this, Euratex works towards the creation of favourable conditions for the manufacture textile products and clothing within the European Union. The CIE has been a member of EURATEX since 1995, working as a link with the Spanish Administration to coordinate the policies of protection for this sector in Europe. Spain is in the 6th position in the textile ranking of the countries represented by EURATEX, with a turnover of 10,371m euros, 8,005 companies and 128,100 employees, behind Italy, Turkey, Germany, France and the United Kingdom. In total, there are 21 countries currently represented by EURATEX: Germany, Austria, Belgium, Bulgaria, Croatia, Denmark, Slovenia, Spain, Estonia, Finland, France, Greece, Hungary, Italy, Latvia, Lithuania, Poland, Portugal, the UK, Switzerland and Turkey. The textile industry is a fundamental corner stone of the European economy, acting in its various regions and countries. The members of EURATEX represent 174,000 businesses, with a total turnover of 162b euros and over 1.66m workers. The EU is the second exporter of textile products and clothing in the world. The percentage of exports out of the EU reached 28% in 2014. The textile and fashion products of the EU are manufactured respecting the environment, the consumer’s safety and working rights. EURATEX relies on an ambitious scheme that will implement the sustainable growth of the European textile industry. 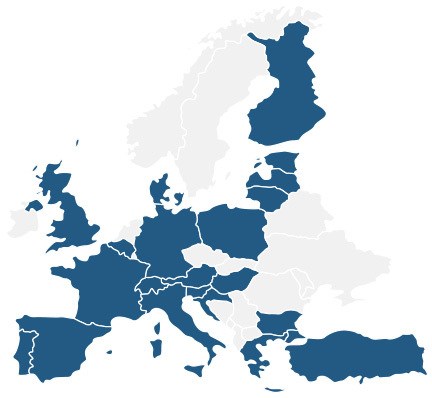 EURATEX provides the EU institutions with detailed information and means of facilitating policy decisions which can enhance the growth of the European economy and help create employment. One of its main goals is to facilitate the introduction of new companies into the European market, SMEs in particular. EURATEX acts according to the following priorities: establishing a clear industrial policy, supporting research and innovation and promoting free and fair commerce and production sustainability. EURATEX was officially created in 1996 subsequently to the merging of 3 organizations, active in Brussels since the early 1960s, to support our industry. In 2008 EURATEX was included in the European Union Transparency Records - identification number: 7824139202-85..
EURATEX sphere of activities includes matters involving: trading policies, home market, intellectual property, standardization, I+D+i, working relationships, training and sustainability. EURATEX is one of the founding members of the European Technological Platform for the Future of the Textile and Clothing Industry - PTE. The future of the textile and clothing industry should be developed the existing strength: creativity in the design and development of the products, flexibility of the production management and supply chains, high quality standards of products and services. A flux of basic products approaching their finishing and specialization, involving highly technological processes along the value chain, from the fibers to the final products. The establishment and affirmation of textile products as the chosen materials for many processes and applications in various fields (transport systems, construction, markets involving energy production and the environment, safety and medical applications, consumer electronics, etc.). A movement towards a new industrial age, characterised by personalization, flexibility, production on-demand, together with efficient logistics, distribution and services. Create an efficient network of experts at a European level connected to industry, research organizations, public authorities, financial institutions and other agents in order to converge the efforts and forces of the field into the research, development and innovation of the textile sector, for the benefit of the textile and clothing industry as a whole. Establish common industrial strategies and support the Strategic Research Agenda (SRA) with collaborative research, technological development and efforts into innovating the textile sector, while collaborating with all the related industries. Provide facilities and means to implement research, development and innovation in the textile sector, focusing specifically, but not exclusively, on the elimination of any barriers of financial, legal, administrative or educational nature. Generally speaking, the PTE concentrates its efforts on the allocation of resources to key areas of the I+D+i to ensure the long-term competitiveness of the industry, benefit economical growth, create employment and support sustainable development in Europe. Devoted to openness and transparency, it encourages all and any organization or individual involved in research, development ad innovation in Europe to join them in their activities.